Promotional poster for Kool Ray & the Polaroidz, circa 1980s. Denny de Bourbon passed away earlier this year at age 69. De Bourbon was a longtime central Illinois music promoter who also managed many other bands, many of whom will also either be playing or at the celebration. 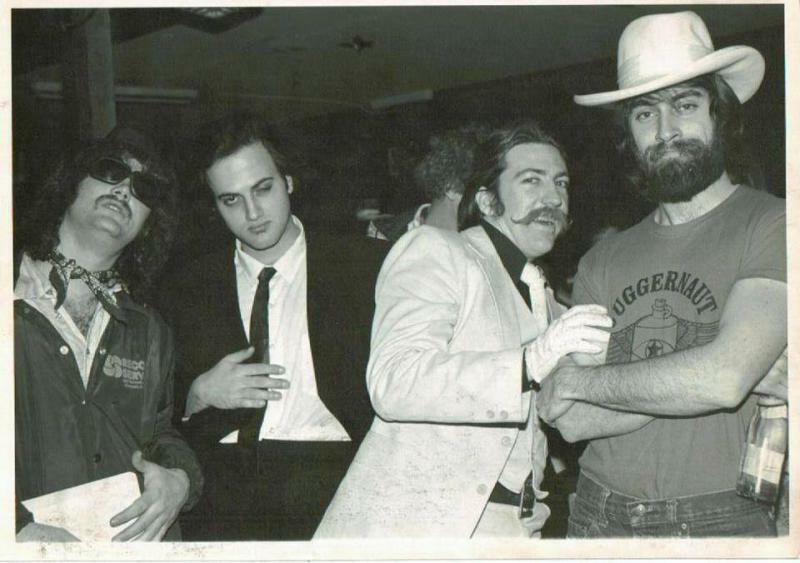 Denny De Bourbon, far right, circa late 1970s when he worked at New Age Entertainment. Credit De Bourbon's Facebook page. Photographer unknown. Alan Wright was a member of Kool Ray's second incarnation. Speaking to GLT from his home in southern California, he said de Bourbon was revered both personally and professionally, and much of that was because he wasn’t cemented in the office making phone calls and booking shows. Wright thought that ethic permeated his outlook on people in general. “He just cared about everybody in life,” said Wright. “Often it’s just business with a band manager or agent. With Denny, it was much, much more than that." "He just cared about everybody in life." Not unheard of in the music business, but certainly rare. Wright’s sentiments about de Bourbon were echoed by many in central Illinois after he died. To a person, they mentioned de Bourbon’s personal touch and fierce loyalty to not just bands, but to the human beings in those bands. Wright said he also had a wicked sense of humor. He said de Bourbon once attended a music conference in Milwaukee with Kool Ray and at least 50 other bands. When a member of another band called the Kool Ray room to falsely say a meet-and-greet function had changed times and Kool Ray not surprisingly showed up late, Wright said de Bourbon went on the sly. “Denny fished around to find out who did that. It was all in good fun. But I woke up one day and the maintenance people were beating on the door next to ours like they were tearing the door down. Found out later their door had been superglued shut. Later on I found it was Denny,” laughed Wright at the memory. Wright recalls his time with Kool Ray fondly, and remembers a vibrant central Illinois music scene in the 1980s when the Peoria based band was in its heyday. Wright now lives in southern California where he continues to play and record music. His Alan Wright Blues Band obviously leans slightly away from Kool Ray’s sound, but he said it isn’t far removed from how he approached his music in the 1980s. Returning to central Illinois to celebrate de Bourbons’s life has Wright obviously excited to see his old friends and musicians. “This deal for Denny’s celebration is going to be a huge music deal, and I’m going to see a ton of people I haven’t seen for a long time. Great players I’ll get to play music with, which is going to be my pleasure. I’m just looking forward to catching up with everyone I haven’t seen for a long, long time,” said Wright. This is the current lineup scheduled to perform at Daddio’s. Doors open at 4 p.m. with music starting at 6 p.m. There will be a cash bar, and a buffet of finger-foods with a donation box near the buffet line. Any excess donations (beyond the cost of the buffet table) will be donated to Denny's favorite charity (KIND Fund - Kids In Need Of Desks). The GLT interview with Alan Wright. Bloomington native Jenny Bratcher-Crafton, a.k.a. "Jeni-B.," has an opera and musical theater background. But debilitating health issues sidelined the music career of this talented vocalist and songwriter just over a decade ago.